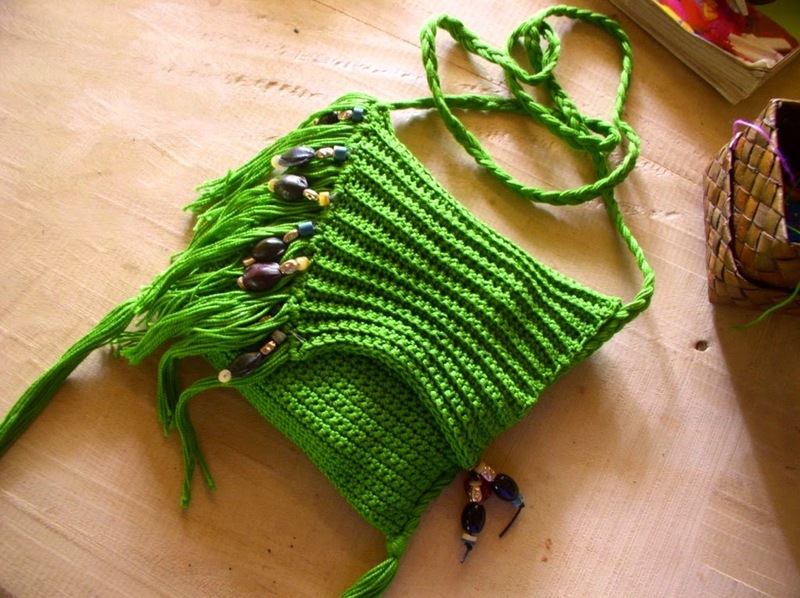 A Beautiful Belly is a crocheted purse that is meant to be worn with the strap over the shoulder, across the chest, so that the purse lies over the belly. 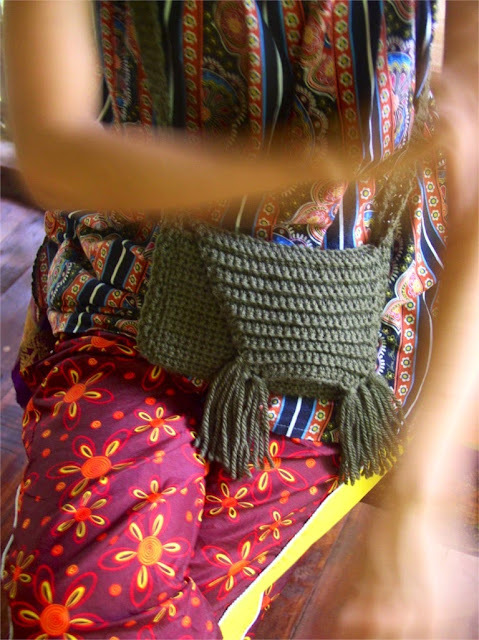 Here, the purse is shown worked in two different colours/yarns. Choose a good strong yarn. Decorate your purse as you please. 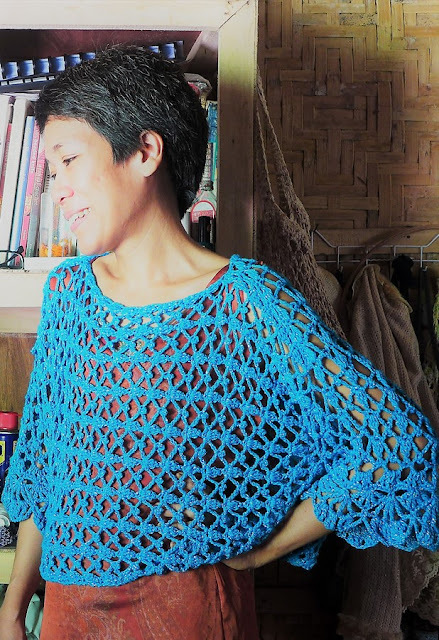 Back Loop Single Crochet (BLsc): Work sc as normal except that you insert the hook not in both loops of the st, but in the loop that is further away from you. The result is a softer, stretchier fabric that looks very different from stitches worked in front loops only or in both loops. Design Notes: From Row 1-46, the entire purse body is worked, then from Row 47-64 is the flap of the purse. 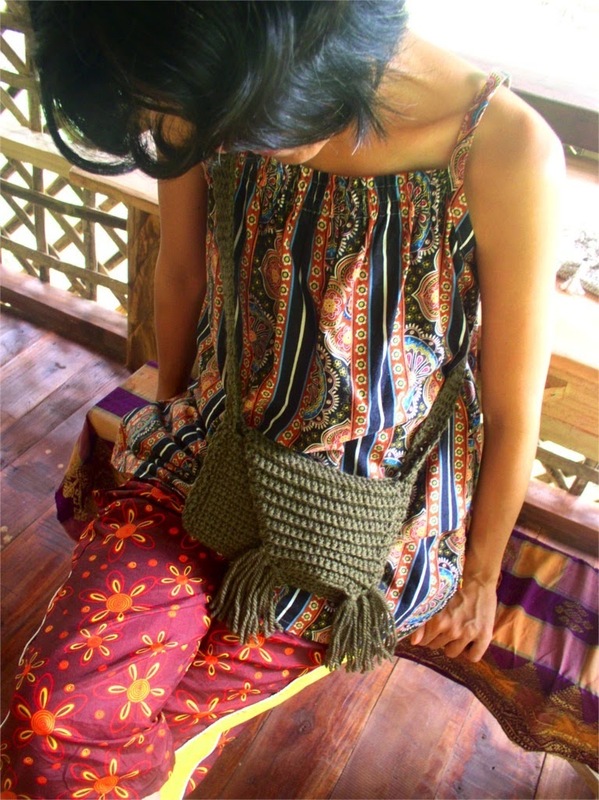 The strap of this purse goes across the torso and lets the purse lie over the stomach. 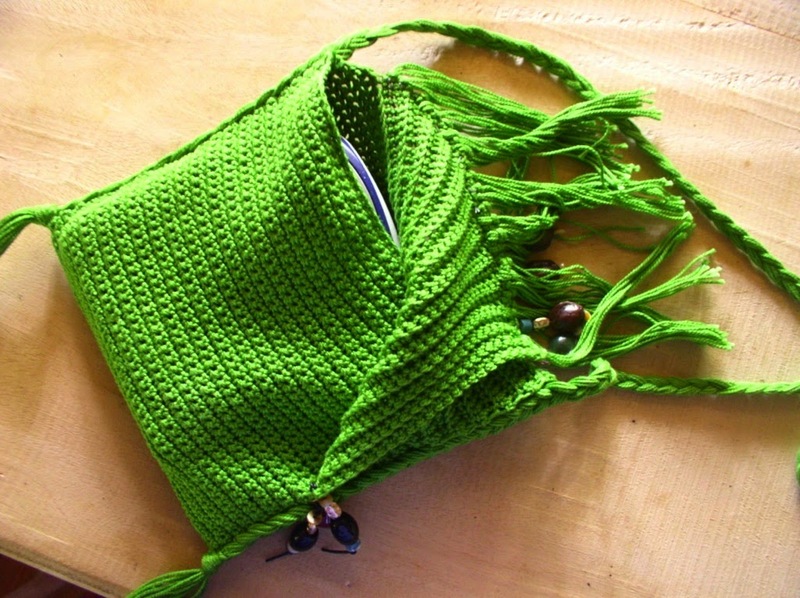 A large belly is perfect for this purse as the curve of the belly pushes against the purse to keep its contents in place and the flap pressing down with one corner sewn to the front panel of the purse. The purse may be made left-handed or right-handed depending on the wearer. Lengths of gusset/strap are given for small and large size. Take your own measurements for a better fit bearing in mind that the wool will stretch and the design works better if it fits snugly to the body. Row 1 (RS): Sc in 2nd ch from hook and in each ch across, ch 1, turn. Row 2-46: Sc in first sc and in each sc across, ch 1, turn. Row 47 (Flap of bag begins here): BLsc in first sc and in each sc across, ch 1, turn. Row 48 (Dec row for Right-handed purse): BLsc in first sc and in each sc across leaving last 2 sc unworked; now insert hook in BL of next sc, pull up a loop, insert hook in BL of last sc, pull up a loop, yo and pull through all 3 loops on hook (sc dec made). Ch 1, turn. Row 48 (Dec row for Left-handed purse): Insert hook in BL of first sc, pull up a loop, insert hook in BL of next sc, pull up a loop, yo and pull through 3 loops on hook (sc dec made), BLsc in next sc and in each sc across. Ch 1, turn. Row 49-63: Rep rows 47-48. Row 64: Sc in each sc across working in both loops of each st. Fasten off. Row 1: Ch 1, sc in 2nd ch from hook, sc in next 4 sc, ch 1, turn. Row 2: Sc in first sc and in each sc across, ch 1, turn. Next rows: Rep row 2 until strap/gusset measures 42” long (58” for large size). Fasten off. With right sides of purse facing tog, fold purse with row 1 reaching to row 46 just before the flap begins. Sew gusset to sides. To make the fringes, cut 4 strands of yarn 12” long. Fold in half and, using crochet hook, draw the folded end of the yarn through corner of flap. Slip the ends of the yarn through the loop and gently pull to tighten the knot. You should now have a long fringe. Make 3 fringes for each corner of the flap. Trim ends of fringes with sharp scissors. Sew corner along straight edge of flap to front panel of purse to close the purse. To open the purse, simply lift the flap at the diagonal edge.